The Immigrant Justice Network presents a resource in English and Spanish for community based organizations, activists, and all those fighting for fair and just immigration reforms at the federal and local levels: The Short Immigration Guide to How Arrests and Convictions Separate Families (in English, Spanish update coming soon). 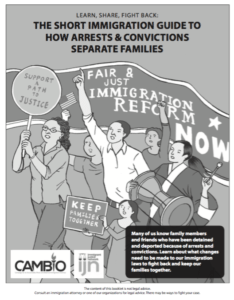 This illustrated guide breaks down how arrests and convictions affect immigrants who have status and those who hope to get it, discusses the impact of current immigration reform proposals, and provides stories and tools for communities to fight back. We hope this resource will be shared far and wide and be used by community based organizations, activists, and others in efforts to fight for fair and just immigration reform for all immigrants.